Now, months later, there is an equally nutty petition being circulated. It calls for Speaker Nancy Pelosi to be removed from office for treason. The underlying assumption is since she opposed negotiating with President Trump about his border wall until after the government reopened last week, she must be a traitor. I guess the sponsors of the petition have amnesia. Wasn’t it the president who said, in early December, he would be proud to shut down the government (and not blame the Democrats)? If that wasn’t enough, I assume those same sponsors have forgotten their high school civics lessons: Loyal political opposition isn’t treasonous, it is essential to our way of life and American democracy. So you know, I first met Nancy Pelosi in 1978. I knew then she was destined for greatness. In the event both the president and vice president become incapacitated and no longer can serve, she would be next in line to become commander-in-chief. After watching her navigate the choppy waters of Washington for decades, I, for one, would sleep well if Nancy Pelosi ever became President of the United States. I’m guessing those who like Ted Nugent’s brand of politics and/or want the speaker removed from office would immediately begin circulating more goofy petitions. I appreciate Ms. Apodaca taking the time to write a rebuttal to my letter on eucalyptus trees. I too have lived in Laguna Beach (40 years) and own a home – where a view is a driving force in successfully selling many homes. I would assume that apartment dwellers also want views or proximity to ocean. Laguna has one of the most beautiful coastlines in the world and I have been to almost 80 counties – many having coastal access. That was what brought the initial homesteaders. That has not changed. I bought my house primarily for its view. A property owner in this neighborhood planted eucalyptus trees for spite, etc. and purposely blocked views. I even heard them talking to someone else as they said, “That should block their view.” Some people call these spite trees. And I believe certain organizations have used their muscle to minimize views and increase anger in this town. Laguna Beach does not have commercial citrus growers nor any venues that extract the oils, wood, and other potential byproducts. So, do we need to forest Laguna with trees that have a worldwide reputation for fire hazard, depleting soils of nutrients, and aggressively taking on ground water? This minimizes the possibility for other plants to grow successfully near these trees – is this good for gardens? So do we need to have a forest of eucalyptus trees that are also disease-prone? I have not seen eucalyptus trees listed anywhere that claims they can withstand high winds. Often these trees are the first to fall. The making of Laguna Canyon was a process started millions of years before eucalyptus trees were brought into town by some folks who had no idea of what planting them would do to our community (in addition to divisiveness). They do not line Laguna Canyon Road – in fact great expense has been used to remove plants in close proximity to the road. That is how the 1993 fire was started and it jumped up the slopes and the rest is history. These trees have not prevented flooding in the recent fires in Malibu, etc. Many of the eucalyptus trees burned with the fire/homes. Fire – in 2017 Portugal/Spain experienced extreme fires in the eucalyptus groves that were providing an ongoing supply of wood for paper. At least 64 people were killed – many trapped in cars trying to escape. There were 204 injured including five firefighters and one child who were severely injured. This was the largest human disaster in European history. I was in Portugal in 2018 and saw some of the devastation. The Minister of the Interior resigned because they were not able to control the fire and mitigate damage. Australia has annual bush fires and homes are destroyed as well as wildlife. (By the way, you do not mention wildlife in your letter – we do not havekoala bears in Laguna Beach to help hold these trees in check). There is a reason why much of the firewood sold in California is from eucalyptus trees – burns quickly and yes, causes fire. Health benefits? Inhaling all the smoke from fires is not a good thing. You can buy the oil readily in many health food stores. Because of our wonderful ocean breezes – we have clean and fresh air everyday – I really don’t use products to clean my house that have any fragrance as many people are actually allergic to the residual of the oil from this plant as well as others and of course the man-made chemical. Because of the liability of trees in urban areas, there are many attorneys specifically dealing with issues of falling trees, debris, fires, etc. Check out their website for details. Eucalyptus trees take ongoing pruning, cleaning up of debris (check how much the City spends on this or any of the few conscientious homeowners who trim their trees on a yearly basis). Some of these trees are downright ugly – long shards of shaggy peeling bark that can damage cars as they drive by or are parked under one of these trees. The list goes on – so will the issue of fire as Climate Scientists are predicting that California will only become a fire hazard state with the increase in temperature and lack of rain (even though there are many who do not believe in this). Do we want to increase the loss of human/wild life, destroy homes and much of the positive vegetation that we can grow instead, etc.? Many insurance company are no longer going to insure property in areas that are deemed “fire zones”. I could provide more information but I won’t for now. Let’s Save Laguna’s Downtown Charm (and its businesses)! Please bring back the dark bar and backlit aquarium, the bamboo booths, scorpions, and especially the teriyaki T-Bone steak. Ahh…if they only knew. Recall that Liberate Laguna, a small group of development-connected residents, spent over 200k on the recent election to elect their preferred candidates, who they may have felt would fast-track major development projects. A few weeks after the election, Liberate Laguna’s approved councilmember Peter Blake launched an effort to “reset” (aka fire) all city board/commission members, and replace them with what many feel will be his (and Liberate Laguna’s) allies. The first board targeted is the Design Review Board. Now, one of Liberate Laguna’s backers, Mr. Honarkar, has offered the city $250k to hire a highly compensated and dedicated Planning Manager and establish a special developer channel so the city can speed up what many of us feel is a fair and deliberative process for reviewing and approving their major projects. It is my opinion that any project approved by this “dedicated” Manager and expedited process would be tainted by the suspicion of conflict of interests. It takes time and impartiality to get projects right. Remember the Montage review process and how the time spent on that proposal resulted in a much better project than the one initially submitted by the developer. According to the City Manager’s notes, the proposed 250k payment for this new planning channel was to be structured as a charitable, tax deductible contribution! And the contract to be written so the payment is not considered a quid pro quo hoping it can then be declared tax deductible. Really? It sure did not take Liberate Laguna backers long to validate the fears many residents had about their true intentions. Somehow this entire proposal just does not pass the smell test. This past Tuesday, the City Council was to consider acceptance of this contribution. However, in spite of the City Manager’s earlier recommendation that the council approve the offer, Mr. Pietig wisely decided to pull the item from the council’s regular order agenda. This proposal would have created more problems for the City than it would have solved. If residents wish to make tax deductible contributions to our city, I would recommend our leaders suggest they look to the needs of the homeless shelter and our senior citizen center, maintaining and expanding our open space, improving our water and air quality, supporting the free health clinic, making improvements to our schools, etc. All of these areas deserve a 250k infusion more acutely than our hiring another planner dedicated to exclusively serve the financial needs of any one or more specific developers. I am not an arborist nor do I own a nursery. My family has been in and out of Laguna since the 1920s. The eucalyptus trees are great wind and rain breakers. Each of the orange groves were surrounded by eucalyptus trees to ward off the wind cutting through the grove and doing damage. They also bend very well without breaking on the days of Santa Ana winds. For Laguna they help in preventing flooding. The Laguna Canyon had been lined with eucalyptus trees for the roots to help dissuade a flash flood through the canyon. 90 percent of the root system is in the first 12”. The trees grow very quickly and have many health benefits, The canyon was formed from water rushing through it too quickly so it eroded. The trees that are there help to keep the canyon from damage. We have all reaped the benefits of the eucalypti in the oil for breathing, antibiotics, pulpwood for toilet paper/paper towels, deodorants, and cleaning supplies. They are tall and thin, and if maintained, do not block as much views as a pine, maple, oak or other trees that have been planted in town. The battle of the “view people” verses the “tree people” could easily be taken care of if the “tree people” would be required to trim and thin their trees yearly. If you want to see photos of how OC looked and more information regarding these trees, click on this link to a PBS special: www.kcet.org/shows/lost-la/who-eucalyptized-southern-california. On Tuesday evening (tonight), the City Council will be voting on a measure that significantly changes the emphasis that the city will be placing on large-scale development in the future. On the surface, the motion appears to simply be a generous offer from one of the more ambitious developers in town to pay the city to hire another person to staff the planning department. On the surface, it seems to provide safeguards by prohibiting the developer from hand-picking the planners, or getting his projects approved faster than anyone else, or being more lenient on his projects. 1. If we need more planners to handle large-scale development, then we should raise permit fees so we will get the funds needed to do this right, and avoid the appearance of collusion. Developers absolutely should be charged the actual cost to the city of administering our planning process for large developments. This should be done with a published building fee schedule rather than through ad-hoc donations. 2. Upon careful reading, we find that this explicitly puts large-scale development on a fast-track that the average resident does not enjoy. The proposed position to be created is for “Funding of Advance-Level Planning Services in the Community Development Department and services in other City departments with regard to the processing of applications for major development projects.” Currently Major Developments get treated equally with all other development. With this legislation, Major Development will have its own, dedicated queue. We should address the entire planning process for large-scale developers and residential development alike. 3. There is more to major developments that just getting them through planning. How about building inspectors and the incremental cost of public safety? How about management of mitigation for the congestion that will be caused by trying to accomplish all of that construction at once in this town with only three ways in and out? Financing all of the associated social costs needs to be considered in as much detail as the planning department headcount increment this seems to be. --Fix funding for the planning department by increasing the fees to be commensurate with resources required to service development projects without resorting to a “tip-jar” approach. --Do not put Major Development on a special track through the process. Fix the process for everyone, including (especially?) residents. 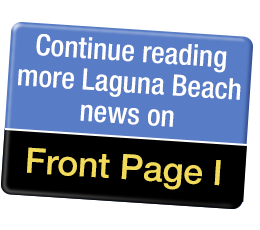 --Before incremental changes are made here and there, do a systematic inventory of the incremental cost of major development in Laguna, then find tax, fee, or Mello-Roos funding for those costs so that residents do not have to pay for it. Is Laguna Beach still an environmental leader? Moulton Niguel Water District has been awarded the state’s highest environmental and economic honor for its efforts to protect local creeks, watersheds, and beaches from pollution, and doing so in the most cost-effective manner by partnering with Orange County Coastkeeper and the Laguna Bluebelt Coalition. When will South Coast Water District, Laguna Beach County Water District, Emerald Bay Service District, and South Orange County Wastewater Authority do something to gain honors to improve Laguna Beach’s ocean environment rather than waste our ratepayer money on multiple, endless, expensive lawsuits? Partnerships lead to progress while lawsuits stop timely improvements while serving as an excuse to delay action on expanding recycled water to all of Laguna Beach for wildfire protection. The Coastal Treatment Plant is over 50 years old and was never designed to handle Laguna and South Laguna’s 8 million annual visitors or Dana Point’s rapid increase in tourism and poop. Dave Connell was born in New York on November 2, 1927. Dave was a Navy veteran of WWII and Korean Wars. He passed away on December 26, 2018 to join his family, friends and comrades who preceded him. He is survived by his loving wife Diane, sons Charles Connell USAF Lt. Col. Retired and John Martese, daughters Deidre Baxter and the late Lori Connell-Snider, and many beloved grandchildren and great grandchildren, nieces and nephews. Dave worked most of his life in the aerospace industry and retired from Autonetics (Boeing). He continued his service to the country by being a patriot and active member of the community with the American Legion and the Laguna Beach Police Department’s volunteer program. Dave’s “Celebration of Life” will be held at the Neighborhood Congregational Church Hall on Saturday, Jan 26, 2019 at 1 p.m., located at 340 St. Ann’s Drive, Laguna Beach. Fund and build the wall. Respect our laws. Protect our borders, and protect US citizens as well as every immigrant who came to our country legally and put in the hard work necessary to respect our laws and become a US citizen, and contribute to our economy, not take from it by living off our welfare programs. Thank you, President Trump. We support you. Hold strong. The future of our country depends on it.